Did you get your fill of ham this past week? We hosted Easter dinner for my family so we had some ham to use up. My husband also smoked a turkey breast (first time) and it was AH-MAZING! We ate a lot of ham and turkey sandwiches for lunch. It worked out well since our daughter is home on spring break. We ended up freezing some to make in some recipes soon. I also made sure to save the ham bone to use in our next pot of beans or soup. I found a great deal on chicken on our last shopping trip so I plan to make good use of it in our meal plan this week. And I guess I am slacking on my calcium this week as cheese was the star of a lot of those dishes. To see any of the recipes, just click the recipe title and it will take you right to it. 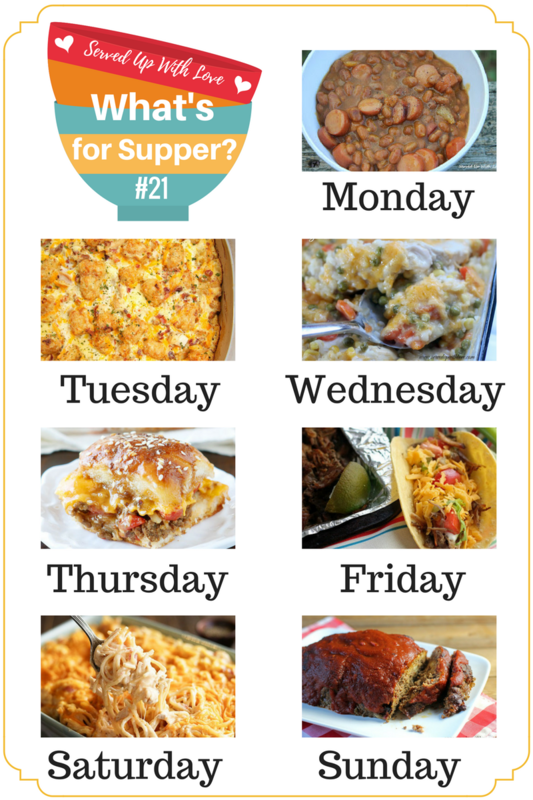 If you are looking for more meal inspiration, check out last week's What's for Supper Sunday.